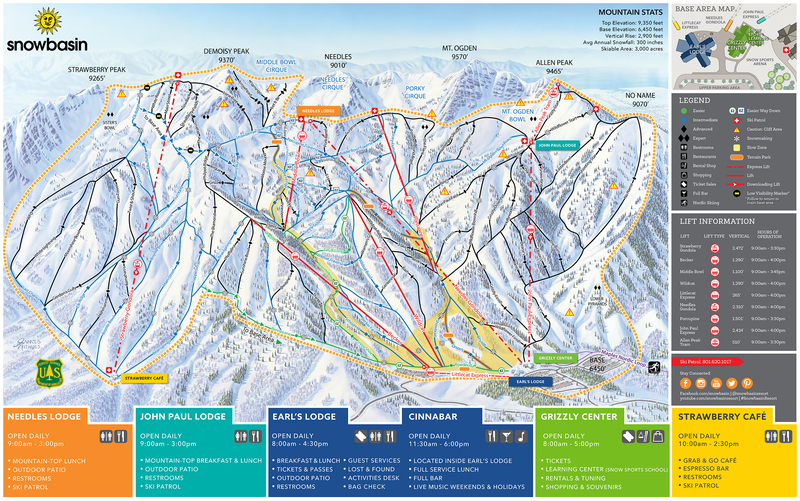 Snowbasin Ski Resort, located in Huntsville, Utah, is one of three ski resorts in the Ogden Valley area. Norwegian skier Alf Engen, who helped the US Forest Service develop the Alta Ski Area in 1938, first recognized the Snowbasin location as an ideal ski area, and the resort opened in 1939. Long considered to be one of Utah's hidden treasures, Snowbasin is now a popular ski destination among locals and tourists alike. Snowbasin has grown from its humble beginnings to offer some of the most advanced technology in the ski industry today. This includes Snowbasin's state-of-the-art snowmaking system, which can create over 600 acres of man-made snow--making it one of the largest systems in the world. Snowbasin also uses a cutting-edge avalanche control system--the only system of its kind in North America--to ensure the safety of its patrons. Beyond its advanced technology, Snowbasin offers its guests luxurious lodging accommodations, exquisite dining options, equipment rental, child care, and a myriad of other services. Summer activities at Snowbasin include hiking, mountain biking, the yearly Xterra race, exercise classes, and much more. At a base elevation of 6,391 feet, Snowbasin receives an average annual snowfall of 400 inches. The resort offers twelve lifts, including two gondolas and one magic carpet; three terrain parks and one superpipe; and 104 runs of varying difficulty spread across 3,000 skiable acres. 5935 N River View Cir.